“Merciful like the Father”- The Papal motto for this extraordinary year of mercy! As mothers, we can be a bit overwhelmed on how to live out an extraordinary jubilee year such as the one right around the corner! We can start to think on such a large scale that nothing really changes in our lives. As a busy mom, I myself know what it is like to experience Catholic guilt over missing out on the special graces the Lord wants to provide me and my family. So here is my cheat list of MUSTS for this year of tremendous graces! God is offering us an opportunity for grace and transformation through this gift of an extraordinary Year of Mercy. This special year begins with the feast of the Solemnity of the Immaculate Conception on December 8th of this year and closes with the Feast of Christ the King which falls on November 20th of 2016. This is post one of a two-part series that will continue next month. TOP YEAR OF MERCY ACTIVITIES AND IDEAS! Visit www.marian.org for more ideas and a summary of this devotion and consider practicing this powerful Devotion during this Year of Mercy! You can also download the Divine Mercy App here. 3. Visit A Door of Mercy- Pope Francis is encouraging us to head on a pilgrimage to a designated Holy Door of Mercy. If you can’t make it to Rome, find a local cathedral, shrine or church that is offering a similar grace. Every particular church, therefore, will be directly involved in living out this Holy Year as an extraordinary moment of grace and spiritual renewal. Thus, the Jubilee will be celebrated both in Rome and in the particular churches as a visible sign of the Church’s universal communion. “By crossing the threshold of the Holy Door, we will find the strength to embrace God’s mercy and dedicate ourselves to being merciful with others as the Father has been with us.”-Misericordiae Vultus- Papal Bull, section 14. 4. Write a Letter/ Note of Mercy: Who do you need to forgive? Mercy can be extended whether you are the victim or the violator; we all need God’s mercy and a letter affirming this mercy can go a long way. Think about your many relationships and decide who might need you to extend them mercy. Pick up a pen and write a handwritten letter affirming your desire to live out Mercy in your life. 5. Mercy Journal: Track your spiritual progress and works of mercy in a Year of Mercy Journal. This journal will allow you to write down your prayers of thanksgiving and see that Christ is working in our lives every single day! Mark your calendar for December 8, the beginning of this extraordinary year! I hope that we can all grow in appreciation of God’s Mercy and be an instrument for the Lord. 6. Read More Scripture: “Be merciful just as your Father is merciful” (Lk 6:36). “In order to be capable of mercy, therefore, we must first of all dispose ourselves to listen to the Word of God.”-Misericordiae Vultus. Consider taking some time out in your busy day to read the word of God and allow Christ to speak to you. For the Daily Catholic Readings visit United State Catholic Bishops Conference. Consider placing this site as your homepage for the year of Mercy or sign up to receive the daily readings in your inbox! 7. Do Works of Mercy: As moms we are always on the go, so lets take time out and make sure our life is productive for the Lord. Mercy and motherhood go hand and hand. When we begin to think of others’ spiritual and physical needs, we can be the hands and feet of our Lord Jesus Christ himself. 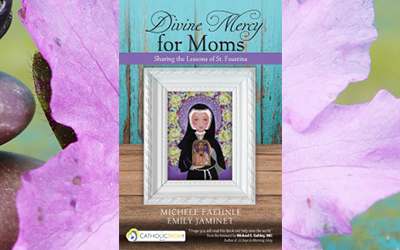 For ideas on how to implement this visit www.divinemercyformoms.com.